Header designed by Daphne at Winged Reviews - thanks, Daphne! Countdown to 5th June will officially start TOMORROW, as The Bookbag run my interview with Keris Stainton! It will run until the 4th June, when Stacey at prettybooks interviews Sally Nicholls. I'm so thrilled that the event is kicking off, and that there's been so much interest from bloggers, authors, publishers, and publicists. I'll be posting a weekly round-up here - probably on Wednesdays - but please take a look at the schedule and bookmark any blogs whose posts you're particularly interested in (all of them, right?) 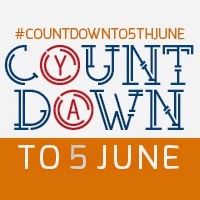 and/or follow @countdownya on Twitter where we'll keep you up to date daily with the tour's progress. There have been so many people involved in this tour that I don't want to pick individuals out, except for one. Daphne from Winged Reviews has been utterly amazing, designing our glorious graphics - the banner above and the button below - AND taking over the Twitter feed this week as I've had a stressful week at work and knew I wouldn't be able to cope with it. A particularly massive thank you to her, but also to all the other bloggers and authors involved. In addition to the announced schedule there's a few other cool things to come - a competition at the end of the tour, and hopefully at least one Twitter chat. I really hope everyone enjoys this, I know I will!